One of our most popular selections, this Gigi Gryce standard has a charming lyric by Jon Hendricks. Available in six keys and suitable for both male and female singers. Click each album cover to hear clips and read detailed descriptions and historical notes. 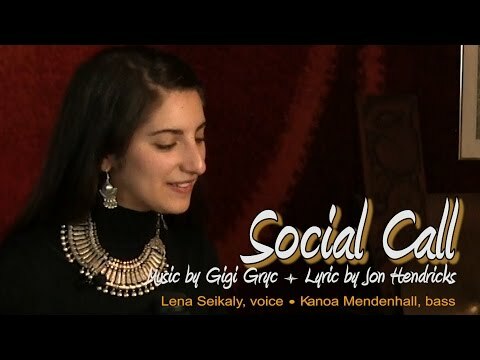 On December 1, 2015, vocalist Lena Seikaly came up from Washington D.C. to our NYC jazzleadsheets.com studio to do three different video presentations of a new Christmas Song, Almost Christmas (Almost Christmas). She met bassist Kanoa Mendenhall for the first time, and before they jumped into the new Christmas song, I thought if would be good to loosen up and get acquainted with something they both knew. With Gigi's 90th birthday only four days before (November 28), Social Call was a perfect choice. Christina Bagley live at Towson University's Center for the Arts. The vocal version of Social Call is a classic, and for good reason. The melody is memorable and lyrical as it weaves through chromatics artfully and with ease. This is one of our most popular songs, so we've chosen a few recordings to feature here, but a quick Google search will yield many more! This Gigi Gryce standard has remained popular with vocalists through the years: Ernestine Anderson , Betty Carter , Earl Coleman , and lyricist Jon Hendricks all recorded it to great acclaim in the 1950s, but the charming song hasn't lost any of its appeal today: rising star Cecile McLorin Salvant released it on her first album and it sounded just as fresh as ever. Other notable singers who have recorded Social Call include Karrin Allyson , Christine Correa and Dianne Reeves . Social Call adapts well to both male and female voices and a variety of keys. We offer it in A-flat, Ernestine's key; B-flat, in which both Betty and Earl sang the piece (Earl an octave lower in his classic bass); C, for sopranos and tenors; and G, which suits low contraltos like Cecile McLorin Salvant, who recorded it in 2010, the same year that she won the Thelonious Monk International Jazz Vocals Competition. Lyric Description: Jon Hendricks' clever lyric addresses a former lover, explaining that things haven't been going so well for the singer and expressing a desire to rekindle the relationship. All of this happens within the context of a simple casual visit, which the singer hopes will blossom into something more. If another key would be better for you, send the key you'd like to Don and we'll post the transposition on the website for purchase. If you're not sure which key is best, send us your range and we'll work with you to figure out the best key. Social Call was written as an instrumental; it was first recorded by the Art Farmer Quintet, which featured composer Gigi Gryce on alto sax. The instrumental key was D-flat and it's available on the instrumental page. A little less than five months after the instrumental recording, Gigi recorded with a nonet, arranging the lyric version for Ernestine Anderson to sing. Six months later, Betty Carter did her recording, and within two months thereafter, Earl Coleman became the first male vocalist to record it. Solo Piano Arrangement: Don Sickler's solo piano arrangement is available. Great for arranger/pianists or for vocalist/pianists getting to know the song. 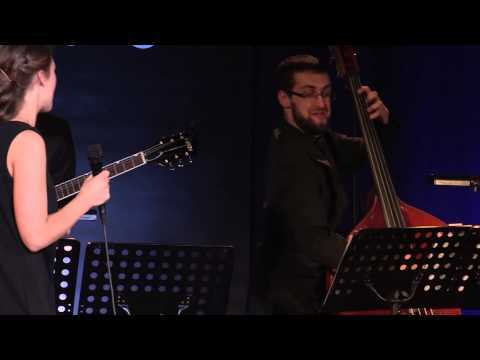 Jekaterina Sarigina, vocals; Viktors Ritovs, piano; Rihards Goba, guitar; Edvins Ozols, bass; Artis Orubs, drums; live in Riga, Latvia, 2014. Betty Carter recorded Social Call in B-flat, a full step higher than Ernestine Anderson, which we recommend for altos and mezzo-sopranos. As you can hear from the audio clip, this melody does require a rich lower register—the low F is featured quite prominently. This is a great opportunity for a mezzo-soprano to work on extending and strengthening her alto register. Of course, if you don't have a solid low F, try Social Call in the key of C instead. Gigi Gryce himself arranged this rendition of Social Call for Betty Carter, and it became the title of her album. The album "Social Call" (Columbia JC 36425) was comprised of a session with the Gigi Gryce orchestra from 1956 and a session with the Ray Bryant trio from 1955. The tracks from the Ray Bryant session were originally released as part of "Meet Betty Carter And Ray Bryant," which was put out shortly after the recording in 1955. The album "Social Call," on the other hand, was not released until 1980. Thus, while "Social Call" was recorded in 1956, it was 1958's "Out There With Betty Carter" for Peacock (PLP90) that became Betty's first solo release. Earl Coleman recorded Social Call in the same key as Betty Carter: B-flat. Of course, he sings it an octave below Betty. For easy reading, we've written the lead sheet in treble clef, so it's written two octaves above where it would sound for a male singer. If you'd like a bass clef lead sheet for this, or any of our charts, email our vocal editor Rachel Bronstein. Unfortunately, Earl's version of Social Call doesn't seem to be currently available as a download, but other songs he recorded can be purchased from Amazon.com and iTunes. Definitely a vocalist worth hearing, again and again. It was only six weeks after Betty Carter recorded Social Call that Earl Coleman became the first male vocalist to record the standard. Earl had recorded a session with the composer Gigi Gryce himself in March of that year (1956) for his album "Earl Coleman Returns." Social Call was recorded for the same release, but on a later session. Interestingly, Gryce did not play on his composition (nor was he present at this later session at all), but Art Farmer, who recorded both the original instrumental version and the first vocal version with Ernestine Anderson (and Gigi Gryce), was on the date.